Iliad Design’s latest 1/72 decal release continues this company’s focus on slightly offbeat but welcome subjects, featuring seven Spitfire Mk.ls in pre-war RAF service. This is a scaled-down version of a 1/48 sheet that Iliad released several years ago, the only difference being Iliad’s addition of two new aircraft to the 1/72 sheet. At first glance, these early Spitfires look rather drab with their Light Earth and Dark Green camouflage, subdued code letters and mostly small B type roundels. But as usual Iliad has chosen its subjects carefully, capturing the subtle evolution in Spitfire camouflage and markings between the type’s introduction to service in August 1938 and the outbreak of war 13 months later. 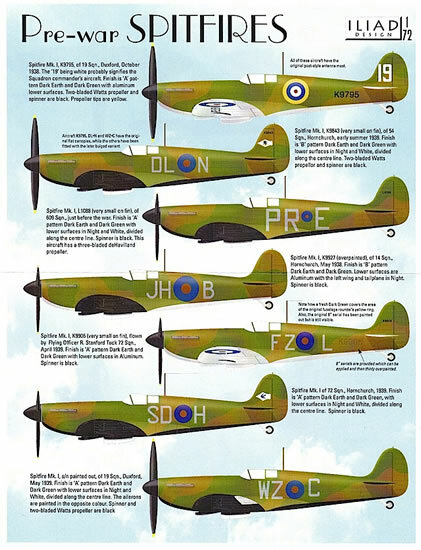 To see how well the Spitfire wore these early colours, look at Brett Green’s 2007 build of the Airfix 1/48 Spitfire Mk.I, which Brett finished using Iliad’s markings for K9843/DL-N – an option that is included on this sheet. Spitfire Mk.la, K9795, 19 Squadron, RAF Duxford, October 1938. This is one of the well-photographed 19 Squadron machines that were shown to the press at Duxford in late October 1938. It is also arguably the most colourful Spitfire on the decal sheet, with its large A1 upper wing and fuselage roundels, prominent squadron number on the fin, aluminium undersurfaces and underwing A roundels and serial numbers. K9795 carried ‘A’ pattern camouflage and was fitted with a two-bladed Watts propeller and flat canopy. Spitfire Mk.la, K9843/DL-N, 54 Squadron, RAF Hornchurch, early summer 1939. Also with a Watts propeller and flat canopy, K9843 had ‘B’ pattern camouflage and a white/Night undersurface scheme, divided evenly along the centreline. By mid-1939, with war imminent, the prominent A roundels had been replaced with more subdued blue-and-red B roundels on the fuselage and upper wings, and the underwing roundels had been eliminated altogether. A small dash of colour is provided by 54 Squadron’s rampant lion badge on the vertical fin. Spitfire Mk.la, L1088/PR-E of 609 Squadron, possibly RAF Yeadon, late summer 1939. L1088 had ‘A’ pattern camouflage, identical undersurfaces to K9843, and oversized squadron codes that looked even bigger next to the small type B roundels on the fuselage and upper wings. This and the next three aircraft were fitted with three-bladed de Havilland propellers and bulged canopies. Spitfire Mk.la, K9927/JH-B of 74 Squadron (not 14 Squadron as marked in the instructions), RAF Hornchurch, May 1939. K9927 carried a modified undersurface scheme of overall aluminium with only the port wing and stabiliser finished in Night. One source suggests that this aircraft was written off in a belly landing in July 1939. Spitfire Mk.la, K9906/FZ-L flown by Flying Officer R. Stanford Tuck, 65 Squadron (not 72 Squadron as indicated in the instructions), April 1939. In addition to its soon-to-be-famous pilot, this aircraft had several noteworthy features: partially overpainted fuselage roundels, overpainted but still distinguishable serial numbers, and (very evident in the one photograph I found of this aircraft) heavily weathered and in some places chipped ‘A’ pattern camouflage. Undersurfaces were aluminium with A roundels and no serial numbers. Spitfire Mk.la, SD-H/serial number unknown, 72 Squadron, RAF Hornchurch, 1939. I found several in-flight photographs of SD-H, and Iliad has nicely captured the non-standard cursive ‘S’ in the squadron codes. Undersurface colours are the same as for L1088 and K9843, although in that section of the marking guide the aircraft has been mislabeled as ‘SZ-H’. The vertical fin carries a flash featuring the swift emblem of 72 Squadron. Spitfire Mk.la, WZ-C/serial number unknown, 19 Squadron, RAF Duxford, May 1939. Photographed in a ground line up at another Duxford press day, WZ-C had a flat canopy, Watts propeller and a 50/50 black and white undersurface scheme set off by ailerons in opposite colours. Iliad’s full colour, double sided painting and marking guide is packed with useful information. On one side, there is a port profile of each Spitfire along with an accompanying description. 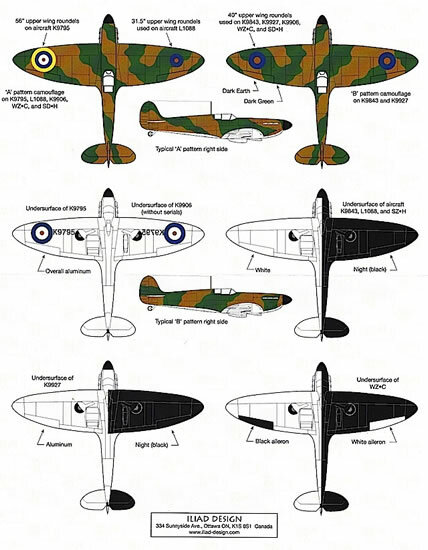 On the other, there are upper and starboard views of generic ‘A’ and ‘B’ pattern camouflage, and illustrations of the four different undersurface schemes applied to the subject aircraft. I was able to find photographs of four out of the seven Spitfires, and these suggested that the painting and marking instructions are accurate. Iliad’s research and editing appears to have been slightly less thorough, at least in a couple of areas. As mentioned above, K9927 and K9906 are listed as serving with 14 and 72 Squadrons respectively, when I think this should be 74 and 65 Squadrons. And the undersurface painting guide refers to SZ-H, an aircraft not represented on the sheet – presumably this should read SD-H? These aren’t huge problems, but they are at odds with the high quality of the rest of the production. The decals themselves appear to be very good. Because of the nature of the subject, there aren’t a lot of colours on the sheet, but those that are there look good. The red and blue of the roundels, in particular, is nicely subdued. Printing is crisp and registration spot-on. The tiny 54 and 72 Squadron tail flashes are clearly reproduced. 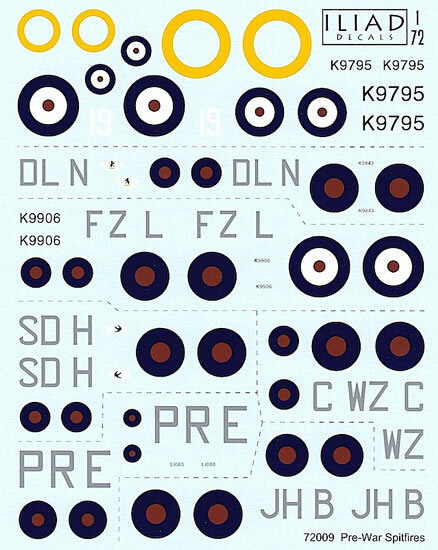 The only multi-part decals are the fuselage and upper wing roundels for K9795, where the yellow outer ring has been printed separately. There’s a fair bit of carrier film around some of the code letters – unavoidable given their shape – so a glossy surface will be essential to avoid silvering. This is an appealing release that focuses on a neglected part of the Spitfire’s history. For anyone building a representative collection of 1/72 Spitfires, it will be an almost compulsory purchase. More broadly, by choosing interesting subjects from some of the first RAF squadrons to operate the type, Iliad has presented 1/72 modelers with an opportunity to finish their Mk.ls in something other than Battle of Britain markings. Highly recommended to anyone wanting their Spitfire model to look a little bit out of the ordinary. Robert Humphreys, The Supermarine Spitfire: A Comprehensive Guide for the Modeller – Part 1: Merlin Powered, SAM Publications, 2000. Alfred Price, Spitfire: A Complete Fighting History, Promotional Reprint Company, 1991. Alfred Price, Spitfire in Combat, Sutton Publishing, 2003. Stewart Wilson, Spitfire, Aerospace Publications, 1999.